There are many techniques you can use for psychic attack protection. The best preventative methods against curses, evil spells, black magic and other paranormal attacks will ensure you are suitably protected at all times. Put your mind at ease. You can use any kind of protective amulet or symbol. Depending on your faith, you may find wearing a cross, Buddha amulet or a talisman effective against psychic attack. You can wear any symbol of faith that offers protection. Use these in your home or keep in your purse or pocket for around-the-clock protection. Cleanse the symbol by rushing clear fresh water over it or leave in the sunlight for several hours. Use only objects that can't be damaged by water or sunlight. Dedicate your symbol to protection by stating out loud your intention for using the symbol. Say a prayer over the symbol according to your belief system. You can use flower essences to ward off and neutralize negative energies, spells, entities and all manner of psychic attacks. Flower essences are typically taken orally. However, you can mix it with a carrier oil for a massage or moisturizing skin oil. You can use the standard of adding four drops of flower essence to a glass of water. Adding the flower essence to a spray bottle of water allows you to spray your home. Flower essence can be added to a base lotion and used daily, since the flower essence is absorbed through the skin. Adding flower essence to a massage oil will transform it into a protective barrier when used. The ancient art of smudging will clear negative energies. 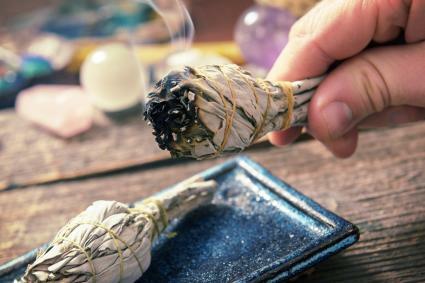 Smudging serves as a magnet to negative energies and carries them away, transmuting them into positive energies. 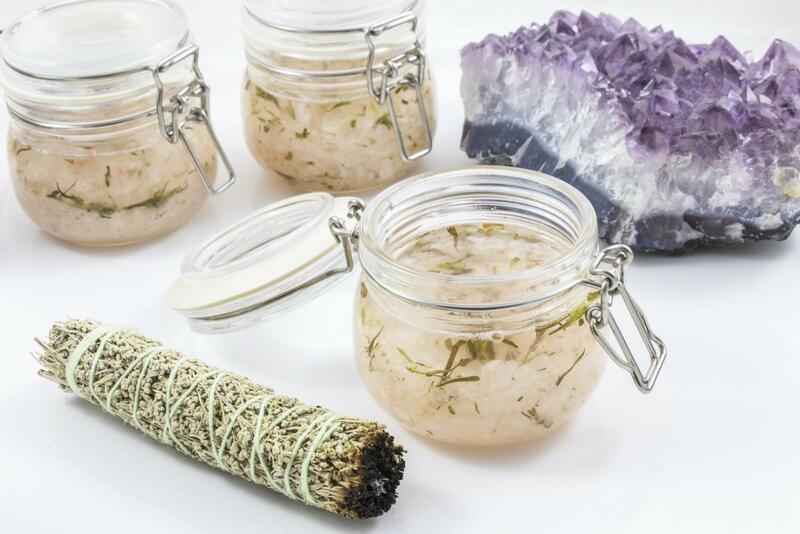 You can burn white sage or other incense to smudge yourself and your home. Light the smudge bundle or stick. Recite a prayer or mantra as you move throughout your home. Start with one room and allow the smoke to fill each corner for a thorough clearing of negative energies that have accumulated. Once you feel satisfied the energy has been met and transformed, move into the next room and repeat until you've smudged every room in your home. Don't forget closets. You can even smudge yourself by letting the smoke encircle you. Say a prayer or mantra the same way you did with your home. Crystals and stones have been used for centuries for their various properties. Wearing a crystal is one of the best preventative techniques against a psychic attack. The different types of energies from the earth found in crystals can fortify your auric energies. Some believe that individual auras are protective energy fields that can be amplified by wearing the right crystal. Amethyst: This crystal has been used since ancient Rome to protect against black magic. Black obsidian: This crystal is used by all kinds of energy workers, even those involved in black magic. It is a highly powerful counter measure to any potential psychic attack. Black obsidian can break curses or spells placed on you. Black tourmaline with mica: While black tourmaline is known for its protective powers, when it contains mica, this stone used by energy healers and shamans becomes a powerful preventative measure against psychic attacks. Labradorite: Author and master crystal healing teacher, Krista Mitchell, recommends using labradorite as a shield. This crystal offers powerful protection against all types of psychic attacks, including psychic vampires. Before using, be sure to cleanse and program crystals for added protection. Make sure that the cleansing method you use won't damage the crystals. Some crystals cannot tolerate water or salt. You can smudge crystals by allowing the smoke to engulf the crystals. You can also chant, pray or repeat a mantra while smudging. Bury the crystals in your yard or garden and allow the earth energies to reconstitute the crystals' power. Leave them for one to three days before digging up. You can anoint the crystals with essential oils. Select an oil that has protective properties to reinforce the protection of the crystal. There are many techniques that can be used as preventative measures against psychic attacks. Choose the one that you feel the most comfortable using.